Rustic Chic Wedding is a bride and groom's peek into the vintage-inspired, timeless wedding of their dreams. A little DIY with a whiff of romance and whimsy goes a long way toward wedding-day magic. Choose from any of the three beautiful wedding themes." Maybe your wedding style is Shabby Vintage Couture Wedding: try the Garden Table Numbers or Monogrammed Cake Stand. Or if the Rustic, Recycled & Re-purposed Wedding is more your speed, there's a Flower Girl Crown and Kissing Bell. The Urban Farmhouse Wedding has instructions for creating a Twig Cake Topper and a S'mores Bar. However you mix and match the projects, your wedding will express your love story, inside and out! 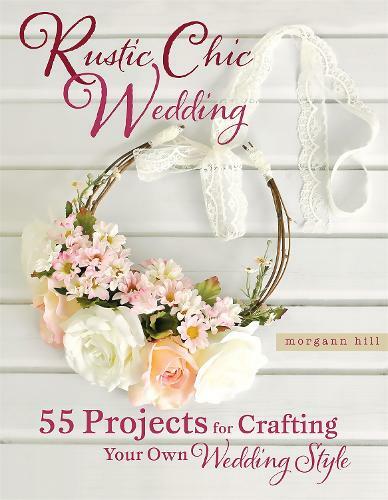 With a chapter on creating the perfect themed tablescape and one dedicated to beautiful bridal bouquets and boutonnieres, Rustic Chic Wedding will be an indispensable guide on the sweetest day of your life. .